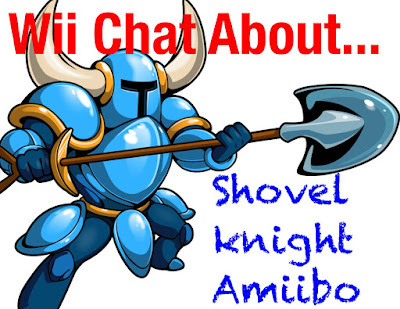 Nintendo Love Affair: Wii Chat About... Shovel Knight Amiibo Unboxed! Wii Chat About... Shovel Knight Amiibo Unboxed! The Shovel Knight Amiibo was released in the states on January 8th and Nintendo Love Affair was lucky enough to get our hands on one without a pre-order. By lucky we mean VERY lucky. There was only one left available in our city at the local Gamestop on release day. Yacht Club Games had repeatedly commented that pre-orders for this Amiibo would not be necessary. However, pre-orders continued to run out and be reinstated over the past couple of weeks. We are not sure what Yacht Club Games strategy was with that messaging, but we were definitely left short handed for Amiibos here. Perhaps Yacht Club Games had to pay a certain percentage per Amiibo produced and didn’t want a lot of extra stock lying around on the pegs. Yacht Club repeatedly ensured customers that there would be plenty of Amiibos as launch and the have ensured that they would make as many as they need to. Although they seemed to have severely underestimated how many Amiibos would be desired by the masses, they will most likely continue to produce the figures until everyone that wants one does. For the lucky Nintendo Lovers that were able to get one, the Shovel Knight Amiibo unlocks a lot of content, especially for the Wii U! Click to see our video review!